Bureaucracy in Japan jeopardizes Prime Minister Shinzo Abe's plans for the nation to be the leader in clean cars such as the Honda Clarity Fuel Cell sedan. TOKYO (Bloomberg) -- Japan Prime Minister Shinzo Abe has big plans for his country to lead the way in clean cars. His bureaucrats are getting in the way. Abe has declared hydrogen-powered fuel cell vehicles “the ultimate eco car,” praising their promise for the environment and Japan’s domestic automakers, which are ahead of the pack. A symbol of the challenges he’s running into is the compact hydrogen fueling station that Honda Motor Co. is having to put on hold. Lengthy criteria that regulators are still finalizing after three years of deliberation is undermining interest from local governments in the stations, which would boost the appeal of Honda’s Clarity Fuel Cell sedan. Bureaucracy risks holding up Japan’s ambitions to lead in fuel cell vehicles and the infrastructure that refuels them, despite Abe’s pledge to ease rules when he endorsed Toyota Motor Corp.’s Mirai sedan earlier this year. As many as 100 local governments have hesitated from ordering Honda’s Smart Hydrogen Station until Japan’s Ministry of Economy, Trade and Industry implements rules that would accommodate smaller fueling facilities. The ministry is aware of criticism of the delay and plans to issue the final regulation by the fiscal year-end in March, Hidehiro Yajima, head of METI’s high-pressure gas safety office. Abe’s government has sought to transition resource-scarce Japan to alternative energy sources and has estimated the nation’s hydrogen market could expand to 1 trillion yen ($8.2 billion) by 2030. Honda developed the Smart Hydrogen Station along with Iwatani Corp., Japan’s biggest hydrogen supplier, to boost supply outside of major cities. Only two are open for testing: one in Saitama prefecture, a suburb north of Tokyo, and another in Kitakyushu, a city in southern Japan. Iwatani won’t disclose the price of the stations for competitive reasons, Sumire Yamazaki, a spokeswoman, said by phone. She declined to comment on the timing of sales for the stations or METI’s rule-making process. While METI has set the criteria on what materials can be used to make hydrogen storage tanks and the amount of space between stations and roads, those have applied only to larger facilities. METI is preparing detailed safety standards for local governments as they decide whether to purchase smaller stations, Kaneko said. Local governments are viewing the criteria as requirements rather than suggestions, which is discouraging compact station sales, he said. 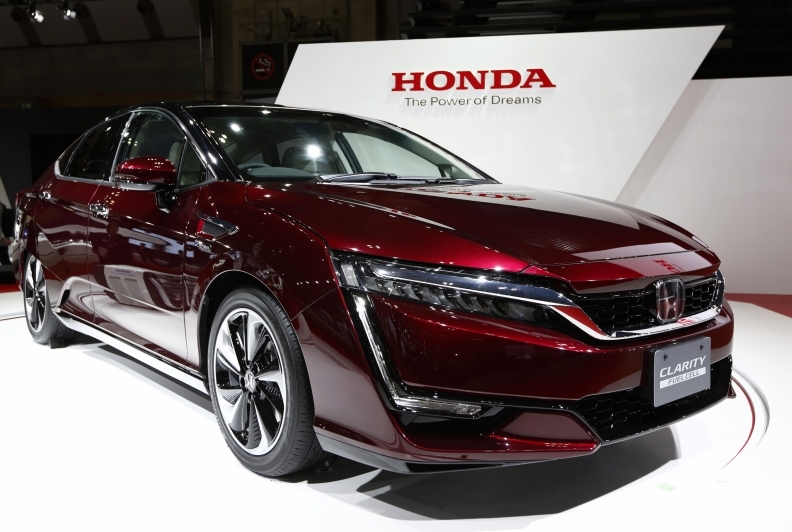 Honda’s strategy to develop stations and refueling equipment and market them with Iwatani goes a step further than Toyota, which has stuck to introducing Mirai and covering part of the operating costs for hydrogen stations. Both companies are betting on fuel cell vehicles, with Honda’s 7.66 million yen (about $62,200) Clarity Fuel Cell beginning sales in March, more than a year after Toyota started delivering its 7.24 million yen ($58,800) Mirai. Toyota and Honda have set conservative targets for early sales of the cars, in part due to scarce hydrogen refueling infrastructure. Toyota plans to make about 2,000 Mirai sedans in 2016, while Honda plans to start selling about 200 Clarity Fuel Cells per year. Promoting a hydrogen society is part of a broader drive by Japan’s government to reduce reliance on imported oil and find an alternative energy source to nuclear power, which has faced public resistance after natural disasters crippled a plant in the eastern Fukushima prefecture in 2011. Toyota plans to boost Mirai sales to 30,000 units, including 12,000 in Japan, by 2020, the year Tokyo hosts the summer Olympic Games. Honda also expects deliveries will increase with efforts including a cooperation with General Motors to cut costs on key materials and components.